The story's protagonist and second year high school student. He was one of the first to notice something going wrong. She's in the same class as Takeshi and also a second year. Childhood friend of Takashi and skilled in soujutsu. Third year student and also president of the kendo club. A second year and self-proclaimed genius. Her quick thinking has helped the group many times. A second year gun otaku. His name and likeness were based on the real-life mangaka, Kouta Hirano, who is known for Hellsing. 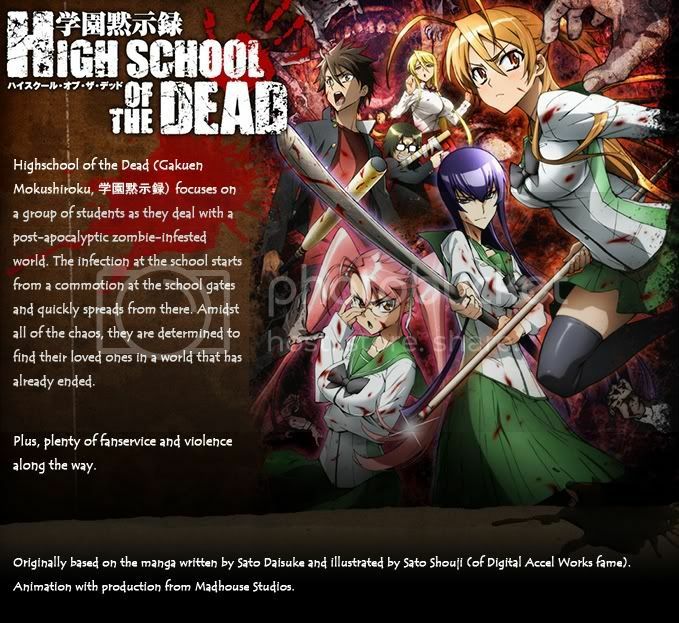 [size=large]OP HIGHSCHOOL OF THE DEAD by Kishida Kyoudan (岸田教団) & The Akeboshi Rockets (Ｔｈｅ明星ロケッツ). Also, READ the manga! Has a stronger visual impact for the character's emotions. It's currently on hiatus though. As for the anime, it's only scheduled for twelve episodes, but here's hoping to more. I never undestood why HOTD got so few merchandise? Really liked this series and looking forward to series 2. Had to own Saeko and Rei figure!